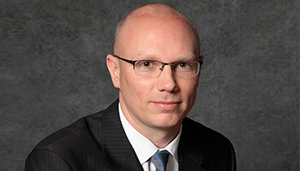 Joseph Jaros is a partner at Rakoczy Molino Mazzochi Siwik LLP. Mr. Jaros has almost twenty years of complex litigation experience, including ten years managing Hatch-Waxman litigation matters exclusively. Mr. Jaros manages Hatch-Waxman cases involving a range of claimed pharmaceutical technologies, including new chemical entities, polymorphs, drug delivery devices, formulations, and methods of treatment. Representative matters involved mometasone (Nasonex), aripiprazole (Abilify), bimatoprost (Latisse), albuterol (ProAir), tiagabine (Gabitril), valganciclovir (Valcyte), ranolazine (Ranexa), capecitabine (Xeloda), doxycycline (Oracea), colesevelam (Welchol), atorvastatin (Lipitor), eszopiclone (Lunesta), fenofibrate (Antara), fenofibrate (Tricor), doxepin (Silenor), ketorolac (Acular), quetiapine (Seroquel), brimonidine/timolol (Combigan), rosuvastatin (Crestor), lamivudine/zidovudine (Combivir), tramadol (ConZip), omega-3 (Lovaza), norethindrone/ethinyl estradiol (Femcon), amlodipine/benazepril (Lotrel), and divalproex (Depakote). Earlier in his career, Mr. Jaros represented clients in a variety of litigation matters, including patent infringement, trademark infringement, copyright infringement, trade secret misappropriation, unfair competition, breach of contract, mass tort and class actions. In addition, Mr. Jaros was lead counsel in a federal civil rights jury trial and second-chaired a breach of contract jury trial. Before joining RMMS, Mr. Jaros was an associate at Kirkland & Ellis LLP and Holland & Hart LLP.